The planning has started and it looks like the Spring 2017 adventure is going to be a dual sport run from Tecate to Cabo and back. 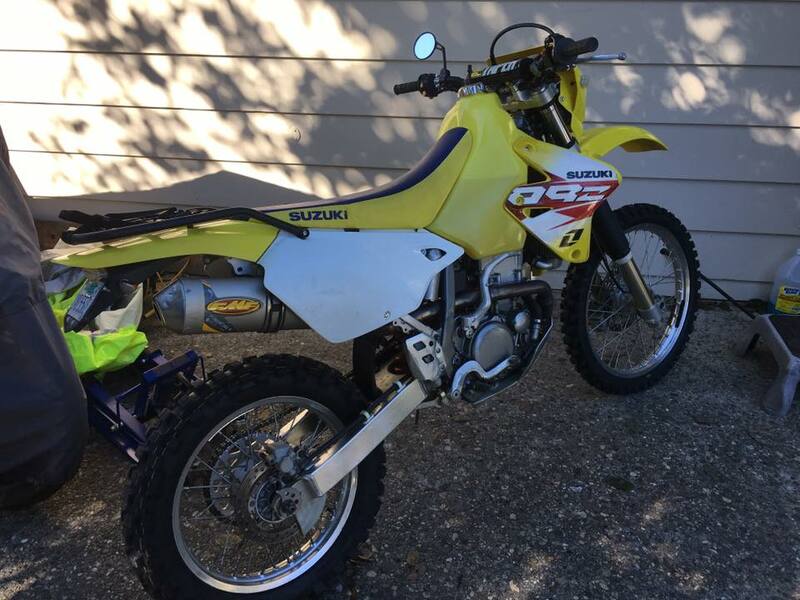 For this trip I picked up a used 2006 Suzuki DRZ400s. I decided to go this route for a few different reasons. 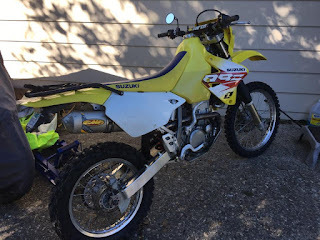 First, I wanted a light dual sport that could handle the Baja sand and rocks. I have Triumph 1200 that I usually ride on my adventures, but she is just way too heavy for the sand down there. And if there's anything I've learned over the years it's this: Having fun is way better than looking cool. 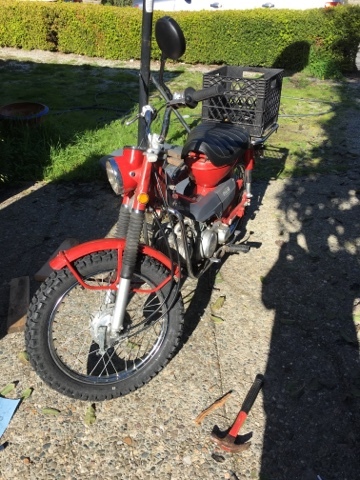 Second, I wanted a reliable bike that's easy to work on. The simplicity of the DRZ400s is it's strength. Plus, I can carry along a small tool bag and do most of the work myself. Third, I wanted something strong enough to haul a little bit of gear. I'm not talking about panniers and a top box. I really want to keep it light and tight down there. But I do plan to have a couple small dry bags, or maybe a Giant Loop. And finally, I didn't want a new bike. I know what it's going to be like down there. I have a feeling I'll be dropping this bike many times and I want to be able to pick her back up, dust each other off and keep riding without a second thought. Yes, I would have loved to pick up a brand new KTM 690... I just couldn't justify it. Hopefully I'm making a good decision and not just being cheap. Well, that's the plan and we have about 6 other guys going on the trip with us. I'll try to post more pics as we get closer. 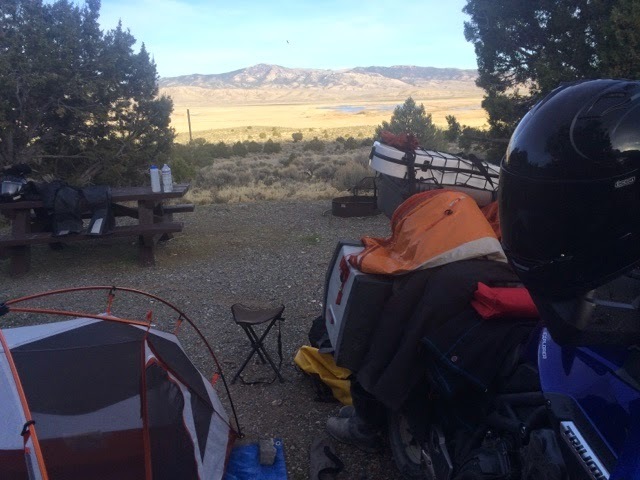 I've been riding a Triumph 1200 Explorer and it's my long distance adventure bike. But now I have a short distance adventure bike. The original adventure moto. I'm thinking I'll strap this to the back of my Sequoia when I go camping and take some off road detours. Can't wait. Well, today we hit hots springs 9 and 10. It's a bittersweet feeling. On the one hand I'm excited that we actually got all 10 hot springs. On the other hand I'm sad that it's over. We met so many interesting and nice people along the way. People who invited us into their camp, shared their fire and great stories. People who fed us and surprised us with ice cream. 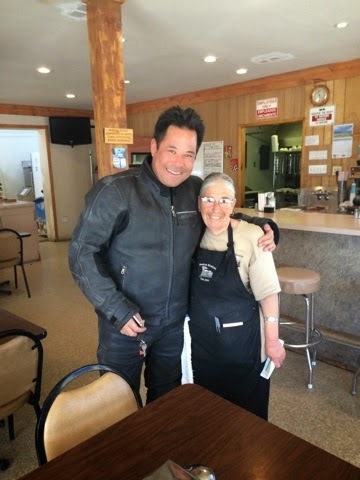 Waitresses who pointed us toward hot springs. 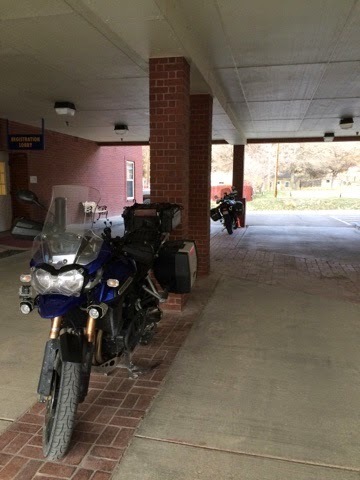 Even a Highway Patrol officer who saw our bikes and showed us a great, winding route that would be fun on our motos. We also discovered hidden canyons and camped under the stars just below the snow line. We found out just how much cold we could endure without freezing to death. We shared hot chocolate every night and a hot cup of coffee every morning. In the end we accomplished our goal: 10 hot springs in a week. We didn't take the easy way either. 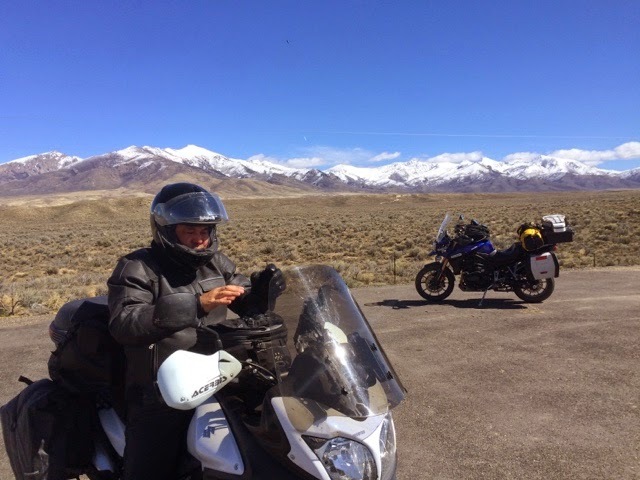 We rode our motorcycles over 1,500 miles and hunted hot springs as far away as the Ruby Mountains. 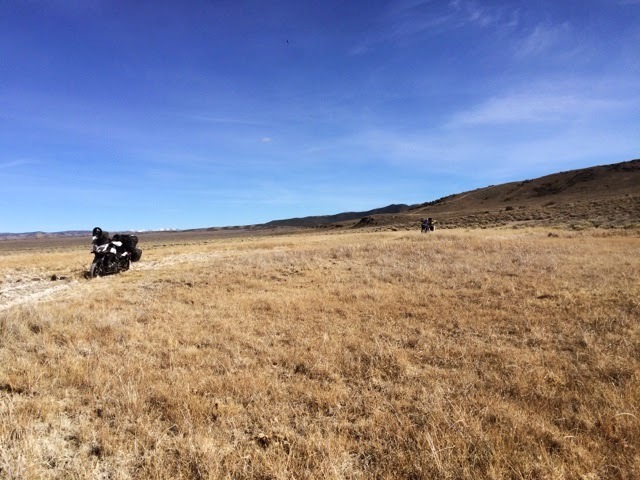 Sometimes it was painful, like the day I crashed twice in the sandy canyons between Duckwater and Hot Creek. 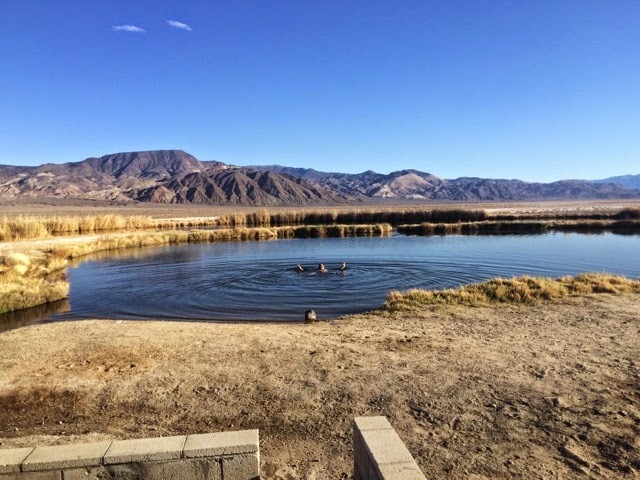 Sometimes it was surreal, like the moment we saw the Ruby Mountain Hot Spring for the first time. Overall, it was an adventure full of stories... And people... And perseverance... And fun. So, tonight we are camping one last night then tomorrow I ride home. I can't wait to see my family. In the next couple days I'll put all the GPS locations on this blog along with a list of the hot springs. And I'll challenge anyone to hit "10 the hard way" and join the club. This morning we woke up with the goal of hitting two more: Chimney and Fish Lake. Our first target was a dud. Chimney Springs was covered over and fenced off. I was pretty bummed. 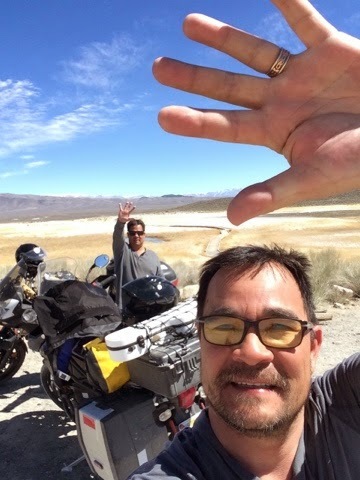 We had been riding for hours, it was hot and I was getting tired of riding my big moto through the sandy gravel. But we didn't waste any time. We hit the highway for Tonopah to gas up. 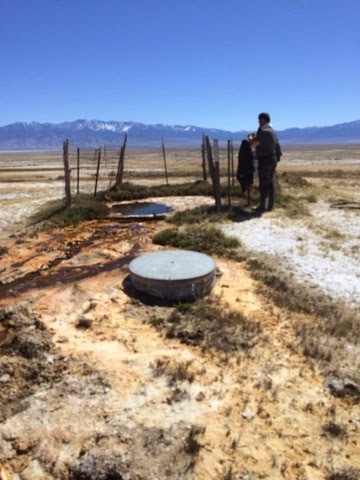 Then, just by chance, I stopped on the side of the road by an abandoned saloon and we stumbled on Warm Springs Hot Spring! This pool is fed by a hot spring that runs down the hill. It was a nice warm soak and it made my day. We got number 7 and we're heading for number 8, Fish Lake. I almost passed up this spring because it was a little out of the way, but I'm glad I didn't... It was another amazing pool. The spring bubbles up and feeds the hot tub. Then it over flows to the first pond which is a nice warm soak and then on to the second pond. Again, we met some great campers who told stories and shared laughs. 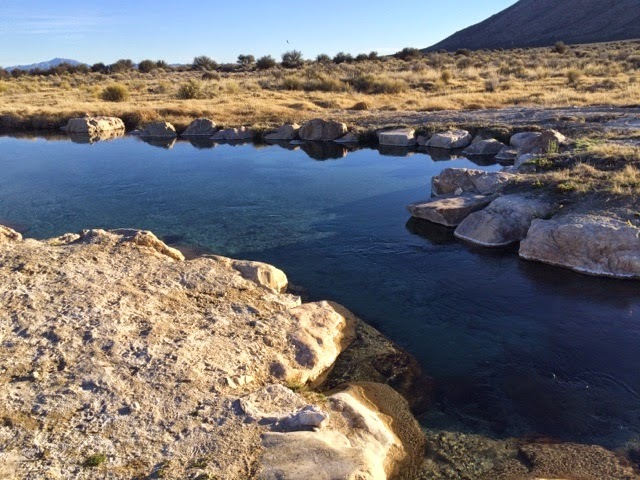 Eight hot springs down, two more to go! 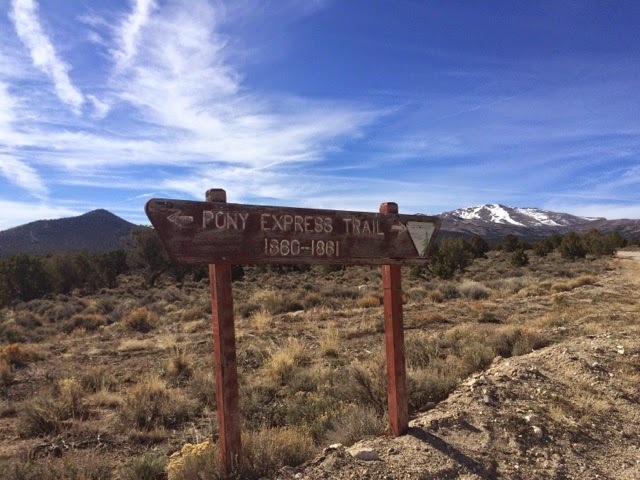 We left the Ruby Mountains and rode our motorcycles over the old Pony Express trail back down to Eureka where we fueled up. 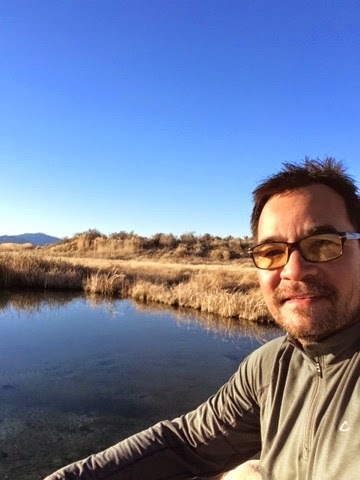 Our plan was to try to hit two more hot springs today... Oh, I should talk about our new obsession: Hot Spring Hunting. 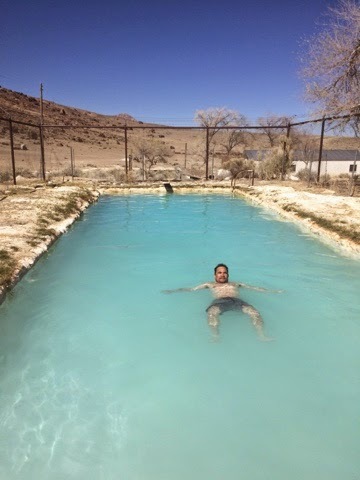 John read about a few hot springs before our trip and he said if we soak in 10 hot springs we can send in for a patch. Well, after sitting in the middle of Ruby valley we decided to give it a try. 10 tubs in 7 days. 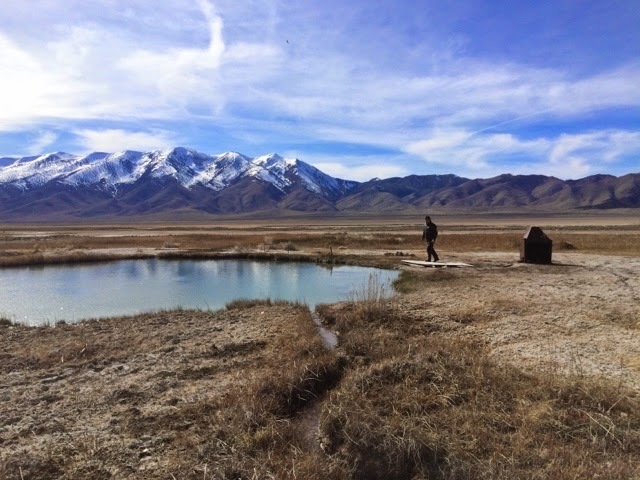 Today our goal was to hit Duckwater and then take a shortcut over the mountains to Hot Creek. Duckwater was amazing. It's crystal clear and big enough to swim around in. After riding all morning I couldn't get in fast enough. Then it was on to Hot Creek... And this short cut I planned. Turns out the dirt road went down through a sandy wash for 20 miles. And the Triumph Tiger 1200 doesn't like sand much. I crashed my bike for the first time and twisted my ankle and knee. Luckily that's all the damage. John snapped some photos so I'll add them later. But we finally made it down to the Hot Creek spring and it was worth it. I was tired, sore and hot. But the pool was just right. We jumped in and floated around for a while. Then we setup camp and made some dinner. As we were pitching camp we met three guys who had been hunting and camping this area for 35 years. They invited us over to their fire for some fun stories. I got to play mandolin for a while and we all laughed and had a great time. I'm happy and tired. 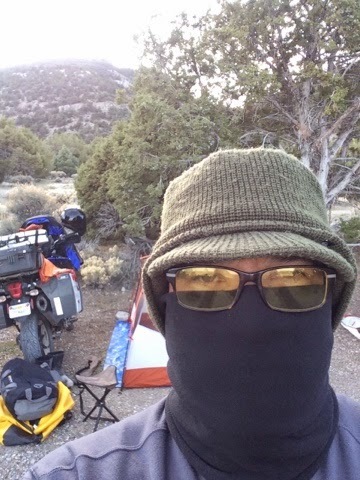 Tomorrow we head for Warm Springs and then on back toward Bishop. The trip is coming to an end but we have 6 hot springs under our belt. Only 4 more and we can get our patch! Last night we stayed in a hotel in Eureka. It was getting late and I didn't want to sleep in the freezing cold again. This was a great choice! It's amazing what a good sleep and full stomach will do for your attitude. Not to mention that the hotel had a hot tub! So we haven't missed a soak day yet. 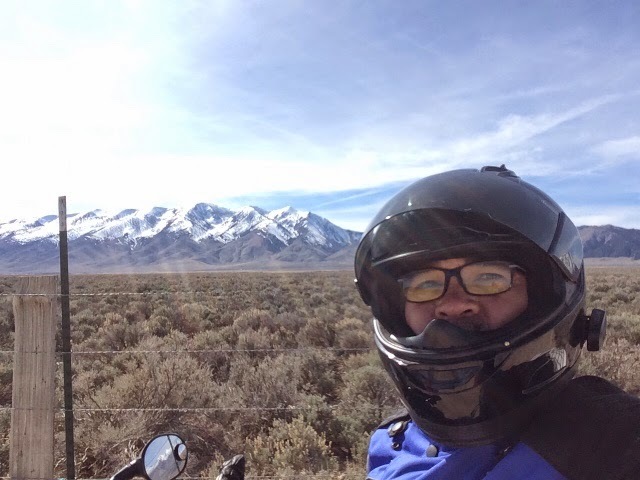 We packed up and left the hotel with one thing on our mind, Elko and the Ruby Mountains. 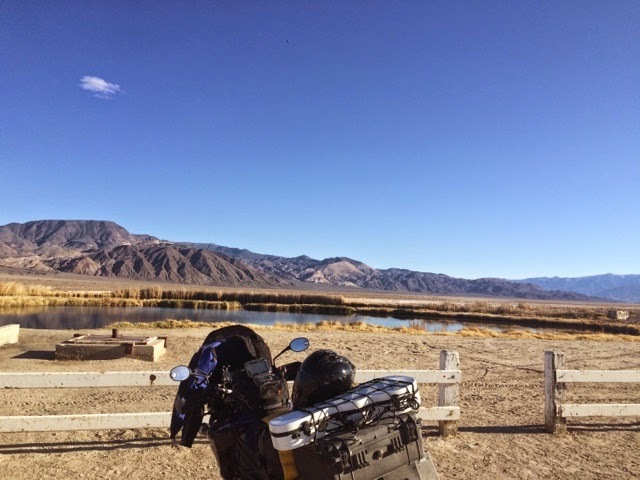 We read about two hot springs up there and a great motorcycle ride around the mountains. 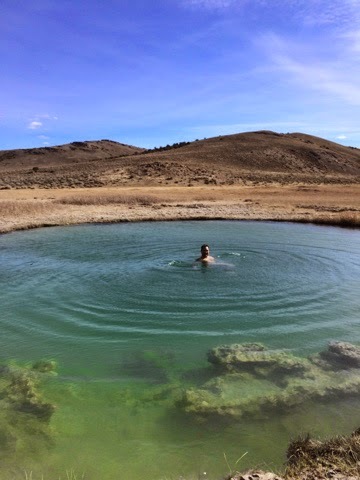 We raced up 278 out of Eureka and got to our first hot springs around 11:00am. Unfortunately the road was washed out and we couldn't get there. So we left Elko a little bummed but determined to find the second hot spring on the other side of the Ruby Mountains. 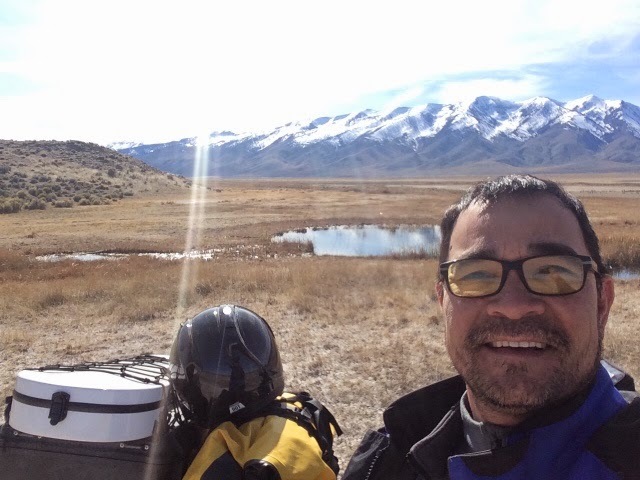 As we rode out of town the mountains came into view, I started getting excited for the adventure. We took an old dirt road around the mountains and up over Harrison Pass. This alone was worth the trip. But what we found on the other side was breathtaking. 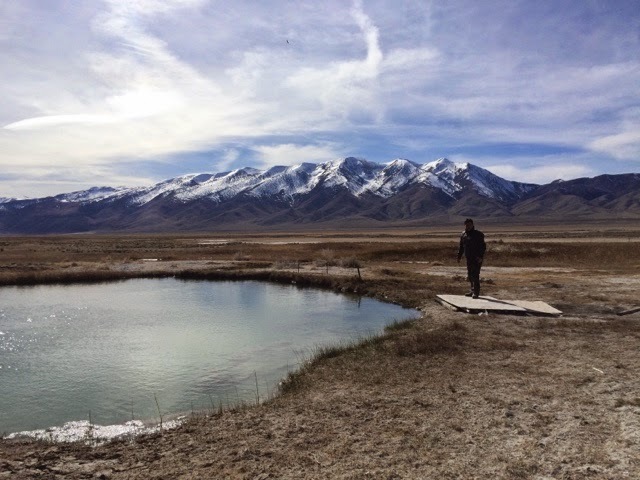 A hot spring in the middle of a wide meadow under the watch of these amazing mountains. I just don't have words to describe how amazing it was. So here are the photos. 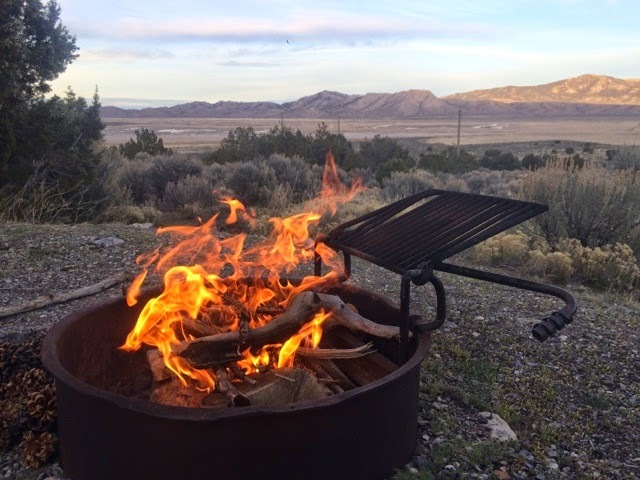 We decided to camp in the Ruby Mountains and soak it all in. Let's hope I can handle the cold tonight.